Due to heavy rainfall and seasonal monsoon a huge area of Moulvibazar was affected by flood. The flood has submerged some 29 unions of the Moulvibazar’s Kulaura, Juri and Borolekha upazilas. Most of the houses, schools and roads were under watered and stranded about 200,000 people. To reduce some distress of the flood affected people Good Neighbors Bangladesh arranged a relief program on 24 July 2017. 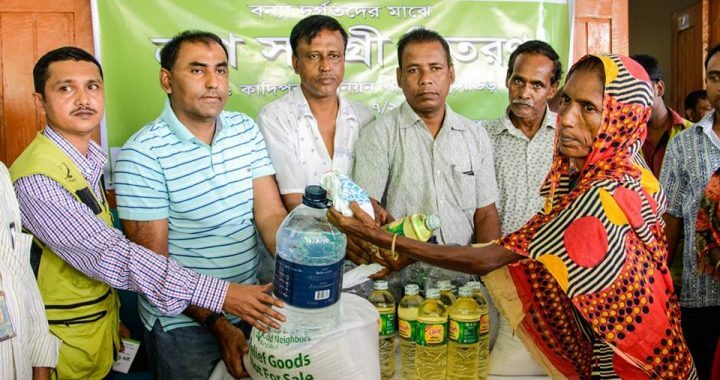 A total number of 500 families from Kadipur Union (under Kulaura Upazilla, Moulvibazar) were supported with rice, edible oil, pulse, salt, sugar and pure drinking water. GNB Moulvibazar CDP staff, volunteers and local elites were present in this distribution program.